VietNamNet Bridge - Many casinos have been or are going to open in the central region, particularly on the coast. Casino services are available in Da Nang, providing different services with gambling machines, deal tables and other games. However, only foreigners and Vietnamese citizens with foreign passports are allowed to enter the casino. Crown International Club, within the 535-room Crowne Plaza Hotel, is the best known casino in the central region. Club 99 at Furama Resort is nearby. Another well known address is One Opera Hotel in the central area of Da Nang. The Club, with 122 gambling machines and 22 deal tables, is considered one of the most successful casinos in Vietnam. However, its position is being challenged by new powerful rivals. More integrated resorts with a hotel, resort and casino have arisen in the coastal areas, in the inner city and around Da Nang, from Hoi An to Hue City. Casino developers in Macau, the world’s largest casino center, who feel pressure from the tighter control and the lack of space in Macau, are trying to set up casinos overseas. And Vietnam is one of the destinations. 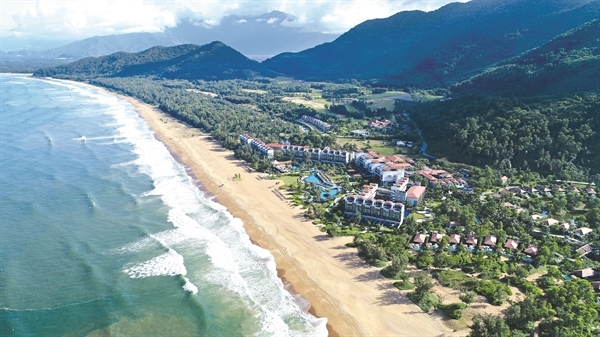 Located 30 kilometers south of Da Nang is Hoiana, a resort with casino, scheduled to open the next year. The project is developed by Suncity Holdings and the joint venture between VinaCapital and Chow Tai Fook (Hong Kong) which covers an area of 165 hectares. Capitalized at $4 billion in total, in the first phase of development, there will be one hotel – New World Hotel (1,176 rooms), Rosewood Residences, golf course and casino. Meanwhile, Laguna Lang Co, situated 40 kilometers north of Da Nang has become operational since March 2013 with the total area of 280 hectares. The resort now runs two 5-star hotels, namely Banyan Tree and Angsana, resort real estate chain, golf course, spa, conference center, restaurants and entertainment complex. Under the newly released decree on casino business, Vietnamese citizens are now allowed to go to the casinos in Vietnam if they can satisfy some requirements. The decree also stipulates that projects with casinos will only receive investment registration certificates after they get approval from appropriate agencies. The minimum investment capital of the projects is $2 billion. After officially receiving the investment license on casino business, Laguna Lang Co raised its investment capital from $875 million to $2 billion, planning to develop 1,300 rooms more by 2021. As for Crown International, the investor said there would be one more tower to satisfy the high demand. In the future, the project will provide about 1,100 hotel rooms and other entertainment facilities. Analysts noted that casino developers in Macau, the world’s largest casino center, who feel pressure from the tighter control and the lack of space in Macau, are trying to set up casinos overseas. And Vietnam is one of the destinations.